Give your car the look and sounds of dual exhaust with one of my popular low cost dual conversion exhaust kits. Using the stock front muffler and eliminating the rear resonator this kit branches off to both sides of the car and will exit out the rear*. This particular setup adds a nice deep tone under acceleration with a small amount of interior resonance just above 2000 rpm. All the needed hardware is included in the kit as well as detailed installation instructions. * Some models will require cut-outs to be made in the rear bumper to accommodate the tips. The 300 and Challenger requires two cuts and the Magnum requires one, the Charger does "not" require the bumper to be modified. Cutting templates and instructions are also included with each kit. For more sound on a V-6 we recommend using a straight-thru design muffler in place of the stock muffler. Product appearance may differ from photo. 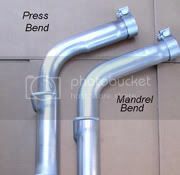 Put this on my stock Challenger SE Rallye along with one of the plain mufflers also available on the site (Flowmaster). Sounds terrific. Highly recommend this combo. Got the kit today, had it on in 2 hours, looks and sounds great! Best product for the money anywhere.